A hand-curated quartet for developers. Herewith, four hand-selected topics from around the Net that developers need to know about this week. You've heard it said, surely, that the Internet routes around damage. (John Gilmor first voiced the censorship version of this adage in 1993.) 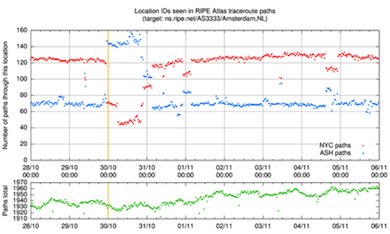 Here is a visible trace of the Net's resiliency from RIPE, the Regional Internet Registries organi­za­tion. RIPE con­tin­ually sends probe packets around the entire Internet in order to gauge the health of the data plane. The figure shows the total number of available routes over time (horizontal axis) from Amsterdam passing through New York (the red data points) and through Ashburn in the Washington DC area (blue). The orange line marks Hurricane Sandy's landfall on the American continent. At that hour, the number of routes through New York dropped dramatically and the count of routes through Ashburn rose correspondingly. After New York recovered power and connectivity over 24 hours later, there were a few more anomalies in connectivity, possibly due to brief ppower outages in the following days. This is an amazing piece of work by GitHub's Tom Preston-Warner. It's subtle. It shows "every commit on every branch of every repository that belongs to a network" across disparate repositories -- but each commit is shown only once. The graph becomes "a sort of to-do list" of code that the person doing the visualizing hasn't yet pulled into their repo, according to Preston-Warner. This blog post by Lea Verou outlines a large number of activities, present and recently past, at the World Wide Web Consortium, home of Web standards. For esample, did you know that CSS now comprises 58 specifications? These incipient standards, and others tracked by the W3C, are in different stages of doneness. Here is a draft of a proposal for toggle-* properties that would apply to every element in CSS. And here is a first public working draft of a Web cryptography API. Finally, enjoy this interview with Robin Berjon, who is one of the team of HTML5 editors for the W3C. He explains the mechanics of how the W3C works with the WHATWG off of a common source to produce different flavors of the in-process specs for different use cases.